The federal Consolidated Omnibus Budget Reconciliation Act (COBRA) generally requires employers with 20 or more employees with group health plans to offer employees, their spouses, and their dependents a temporary period of continued health care coverage if they lose coverage through the employer’s plan. Many states have laws similar to COBRA that apply to fully insured group health plans, including plans maintained by churches and employers with fewer than 20 employees. These are sometimes called mini-COBRA laws. Even if a plan is not subject to COBRA, it may still be required to provide continuation coverage under state insurance laws. Learn the COBRA requirements that apply to the state(s) you conduct business in. COBRA allows individuals to continue their group health plan coverage in certain situations. 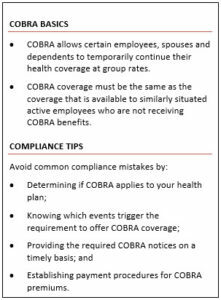 Specifically, COBRA requires group health plans to offer continuation coverage to covered employees and dependents when coverage would otherwise be lost due to certain specific events. These events include the death of a covered employee, termination or a reduction in the hours of a covered employee’s employment, divorce of a covered employee and spouse, and a child’s loss of dependent status under the plan. View our COBRA Continuation Coverage Compliance Overview for more information on managing COBRA Continuation. Companies subject to Federal COBRA regulations should consider ensuring compliance by using a third-party administrator that provides a compliance guarantee. For more information on outsourcing your company’s COBRA administration, please contact us for assistance.